Introduction The founder of Curve Pusher, Vinyl, CD & Digital Mastering, Lawrie Dunster made a decision in 2017 to move from his long-term HQ studio sin London’s Hackney and move, lock, stock, barrel and lathes to Hastings in East Sussex. Cleaner air and sea views + attractive local authority incentives were the principle drivers and for his loyal and amazingly talented staff, a quality of life both professionally and personally afforded by new “world class” studios and sensible property prices. 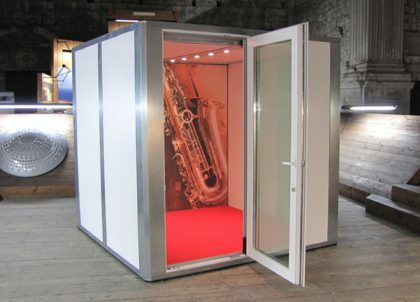 Whilst speaking to Locate Sussex and others in HBC he learned there was a “local company” (Amadeus) with excellent acoustic design credentials to create for him, as he put it “a couple of world class studios”. There followed a get to know you meeting where a brief was taken, and outline plan established. The Old Dairy looking toward East Hill was the building recommended but being amid a heavily populated residential area our client was asked to ensure no sound transmission, a pretty tall order considering that Lawrie and his colleagues would be working in studios where it was not unusual for each to generate >100dB of sound output. So, soundproofing was key, followed by a replication of sound (or better) from the original studios that had been home to CP for over 15 years. Establishing optimum size/s for each of the first two studios would inform the costing process and allow us to produce various plan set ups e.g. : heights/widths, depths, desk position, position of amps, power outlets, location of Neumann lathe. After many revisions we were able to establish and get sign-off on a plan that is represented by each of the two studios featured in the images. 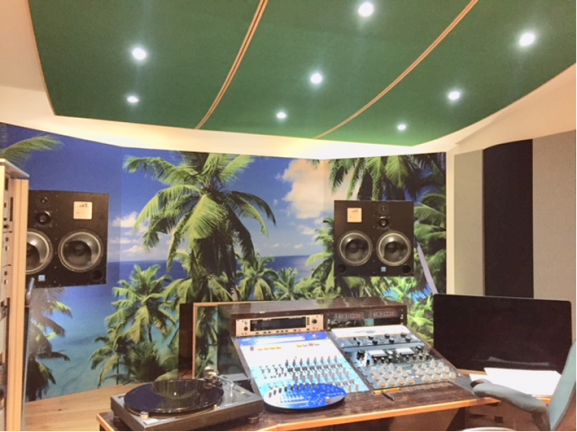 One of the most important design requirements was to transpose a Caribbean beach & palm tree scene onto the wall facing Lawrie’s control desk (see image) this is Studio 2; a very chilled and inspiring image – good for the soul and great for the imagination!